Starting in the 2017-2018 school year, Saint Paul American School began offering 2 additional types of diplomas to students; the STEM Track Diploma and STEM Diploma. Each type of diploma has its own set of graduation requirements that add an increased focus in the areas of Science, Technology, Engineering, and Mathematics. 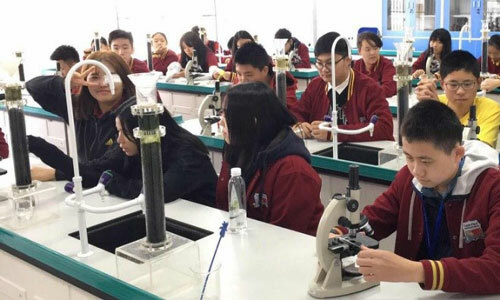 The purpose of the STEM programs is to prepare students for college and graduate study in the STEM fields as well as to foster inquiring minds, logical reasoning, and collaboration skills. In the real world, each one of these fields is intertwined with the others, and therefore all four disciplines are taught together to create a comprehensive STEM curriculum. STEM education uses hands-on, experiential, and inquiry-based lesson plans built on real-world applications. Saint Paul American School offers a variety of STEM opportunities in the forms of both classes and clubs. Classes allow students to earn 1 credit per semester while clubs earn 1/2 credit. Course Description: Pre-Algebra is to serve as a bridge between elementary mathematics and Algebra. This course will build a foundation of algebraic concepts through the use of Khan Academy. Khan Academy offers practice exercises, instructional videos, and a personalized learning dashboard that empower learners to study at their own pace in and outside of the classroom. Course Description: This first-year course is the study of patterns and structure within the real number system. Topics include working with equations, graphing, and problem-solving strategies. Students become adept at solving problems that require the integration of a variety of mathematical concepts. Prerequisites: Pre-Algebra (or have equivalent math skills). Course Description: This one-year course is a logical development of the inductive and deductive systems of reasoning. Emphasis is on developing visualization abilities, analytical skills, and logical reasoning through activity-oriented methods of instruction. Prerequisites: Algebra 1 (or have equivalent math skills). Course Description: This second-year course in algebra represents a mathematical progression from the concept of numbers as experienced in arithmetic to the notion of properties of numbers without regard to their value, a necessary tool for science applications. Formal abstraction will enable students to understand and analyze data in many occupational and academic fields. Prerequisites: Geometry (or have equivalent math skills). Course Description: Precalculus is the in-depth study and application of advance algebra, analytic geometry, and trigonometry; with emphasis on the use of technology, modeling, and problem-solving. The goals are to provide students with the critical-thinking skills and the mathematical know-how needed to succeed in college. 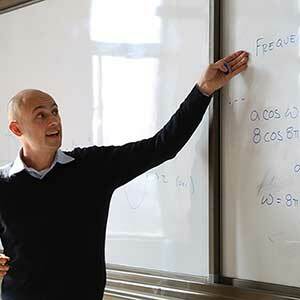 As statistics is increasingly used in college course work, the work place, and everyday life this course includes an introduction to combinatorics and statistical analysis. The purpose of this course is to prepare students for Calculus. Prerequisites: Algebra 2 with a C- or higher (or have equivalent math skills). Course Description: AP Calculus AB is structured around three big ideas: limits, derivatives, and integrals. The concept of limits is foundational; the understanding of this fundamental tool leads to the development of more advanced tools and concepts that prepared students to grasp the Fundamental Theorem of Calculus, a central idea of AP Calculus. Prerequisites: Precalculus with a B- or higher (or have equivalent math skills). Course Description: MS Science is an introduction to physics and chemistry with earth and space ideas embedded throughout the course. 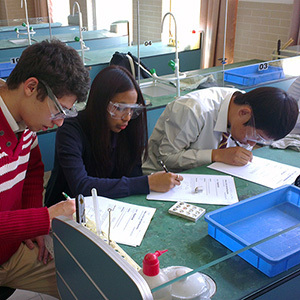 This course is lab-based, which means that students learn primarily by doing activities. Obviously this means that participation is a large part of the class. This class is also used to provide students with a filter they can use to view the world around them. Course Description: Biology is the study of life. During this course students will learn key concepts about biology and the diversity of life surrounding us. After this course, he/she will understand most topical subjects, such as: tumors, cloning, stem cells, etc. In addition, by learning the scientific method, he/she will acquire a different way of thinking. Course Description: Chemistry is the study of the principles of matter and the changes that matter undergoes. In the fall semester, students will develop scientific skills as they explore atomic structure, the periodic table, chemical bonding, chemical formulas and compounds, and chemical reactions. In the second semester, students will study stoichiometry, gases and phase changes, solutions, kinetics and equilibrium, acids and bases, and organic chemistry. Course Description: Physics is the application of mathematics to real world situations in order to understand how the universe around us works. This is a college preparatory physics course that includes probability, statistics, the scientific method, motion, force, gravity, linear motion, circular motion, momentum, optics, electricity, energy, waves, and modern physics. Course Description: This course is an introductory course designed to teach students proficient skills in Microsoft Office. This course will also briefly cover an introduction to computer programming. The program provides hands-on exercises to help students build confidence and proficiency in using the Microsoft Office 2013 interface and features. Each lesson contains “How To” procedures separated from the instruction to ensure that students are learning, not just doing. Assignments also incorporates cross-curricular exercises to teach software skills while reinforcing English, Math, Language Arts, Social Studies, and Science concepts. Course Description: Digital Art expands on foundational skills learned in I.T class and that gives students marketable experience in print media publishing. This course works solely towards the completion of the Saint Paul American School yearbook. 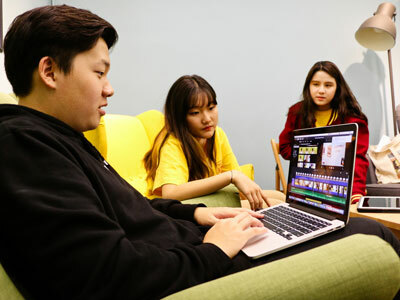 Students will compose, construct, and edit all elements of computerized text layout, graphic art, and digital photography. The result is a wonderful artifact that displays student talent and creativity.